On a recent trip to Tasmania, I bought my lovely friend some earrings at Salamanca Market. They just screamed her name at me because they were in her colours and matched a ring that she often wears! I used the Gift Bag Punch Board to make this packaging for the present. I think she liked it almost as much as the earrings! I used the new double stamping flower images and leaves from the new Lovely Friends stamp set that will be available in the 2017-2018 Annual Catalogue to turn a piece of Thick Very Vanilla cardstock (also in the new catalogue) into patterned cardstock. The colours I chose to use match those in the earrings: Perfect Plum, Elegant Eggplant, Old Olive, Peekaboo Peach and Tangerine Tango. 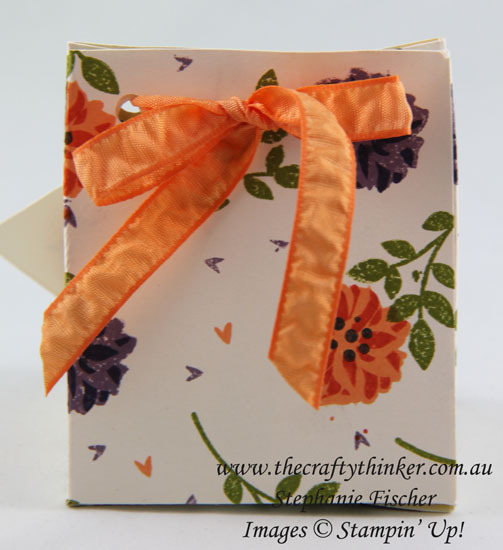 I tied the bag with a length of Peekaboo Peach Ruched Ribbon and added a gift tag stamped with the new Just Add Text stamp set (from the 2017-2018 Annual Catalogue). 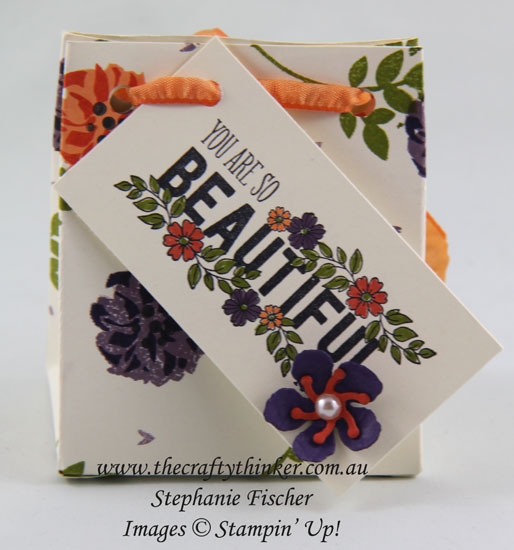 I used my Stampin' Write markers in the same colours as the gift bag to colour the flowers and added a little flower made with the retiring Botanical Builder framelits (I'm REALLY going to miss those!). The little flower covers up the words "to me" because I didn't want the message to sound weird!